Multinomial Processing Tree (MPT) models are cognitive measurement models for categorical data. They describe observed response frequencies from a finite set of response categories (i.e., responses following a multinomial distribution) with a finite number of latent states. Each latent state is reached by particular combinations of cognitive processes; processes that are assumed to take place in an all-or-nothing fashion. A graphical depiction of the 2HT MPT model of recognition memory. MPT models are task or paradigm specific measurement models and widely used (for reviews see ). Their graphical representations usually depict the item type in the root node (leftmost nodes) and each edge depicts the occurrence or non-occurrence of a particular cognitive process leading to a specific latent state. The model parameter associated with an edge represents the probability with which a process is executed (i.e., with which a specific latent is reached). The leaf (i.e., rightmost) nodes depict the observable response categories. Each path from root to leaf depicts one possible combination of states that produces an observable response; the probability of a path is the product of the parameters associated with the edges of the path. The sum of all paths leading to the same response category is the predicted probability for that response category. The sum of all path probabilities per tree is 1. One of the defining characteristic of MPTs is the assumption of discrete latent states precluding modeling of continuous processes. 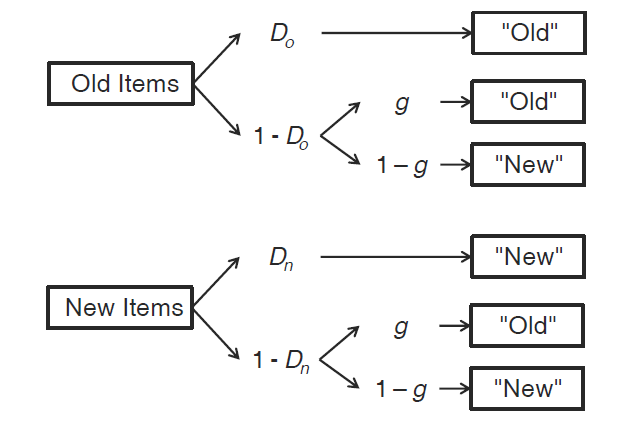 For example, the two-high threshold (2HT) model for recognition memory (depicted in the figure on the left), assumes two distinct memory states: For both old- and new-items a detection state can be reached (with either probability $$D_o$$ or $$D_n$$) in which the correct response is invariably given. In case the true status of an item is not detected (with corresponding probabilities $$1 – D_o$$ or $$1 – D_n$$) an uncertainty state is reached. In the uncertainty state a response is guessed, either “old” with probability $$g$$ or “new” with probability $$1-g$$. It is important to see that the uncertainty state is identical for old and new items: when the true status of the item is unknown the cognitive processes need to be the same. This also helps to make the model parameters identifiable (note that for a simple experiment with one pair of “old” and “new” responses for each old and new items the model parameters are nevertheless not identified). Besides being one of the easiest way to build models that allow to dissociate latent cognitive processes, the MPT model class is statistically well developed (see , for an overview). For example, advanced model selection techniques based on the minimum description length principle are readily available (thanks to the work by ). This makes MPT models an ideal candidate for modeling categorical data. In my work I regularly use MPT models to for measuring the contribution of cognitive processes to observed behavior (see here for a relevant list of publications) and plan to do so in the future. I have developed a package for the statistical programming language R for fitting MPT models together with David Kellen, MPTinR , and I am currently working on a successor. Overall, I am really interested in working with MPT models and in advancing the usability and further development of the MPT model class.